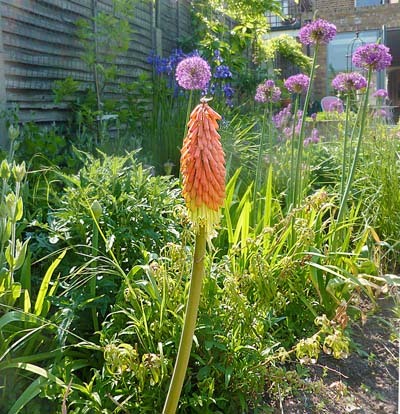 This space was at the back of a large Victorian semi detached house. 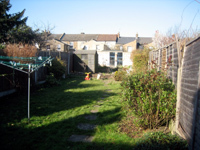 The garden was a North facing, flat wasteland and had bricks and concrete paving slabs of various sizes and shapes all over the place. A large concrete terrace led form the house to the unkempt lawn. Grim fencing panels and a large grey breezeblock wall at the end of the garden, in full view of the house completed the picture. The clients were very specific about their needs. 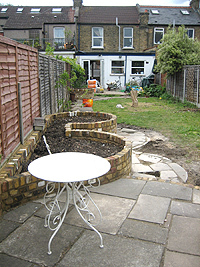 Keen environmentalists, I was told that all materials in the garden had to be reused, as they were not comfortable with dumping all the concrete in landfill. 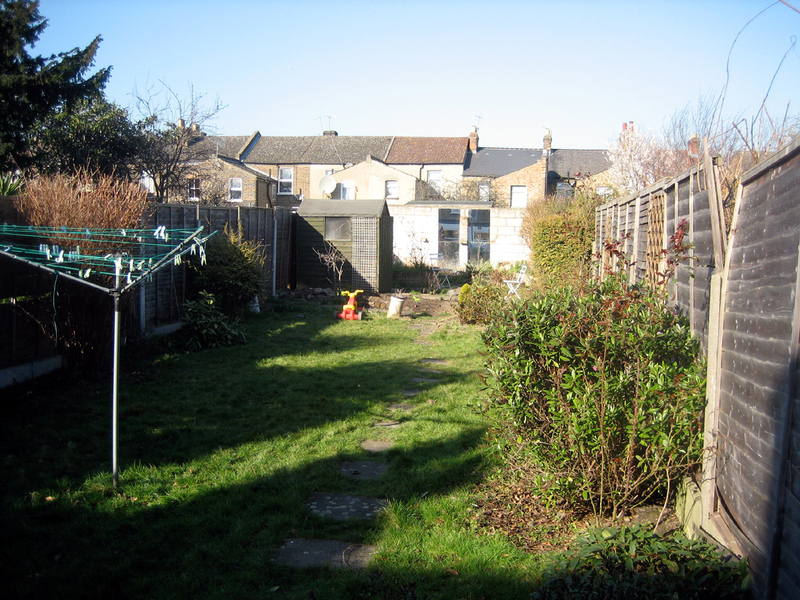 There was to be a large area of garden allocated to fruit and vegetable production and a good-sized lawn for their young son to be able to play on. Recycled materials were to be used where possible and no in organic chemicals were allowed. 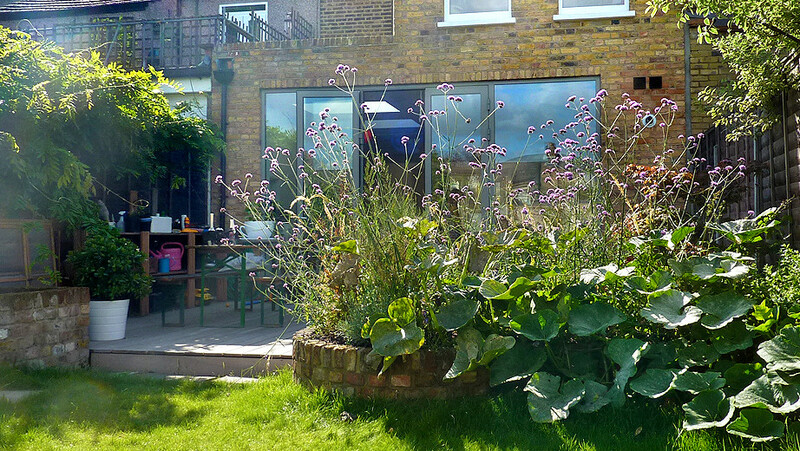 A large Eco studio was to be erected at the back of the garden, which would hide the ugly breezeblock wall. I just needed to be aware of the footprint of the studio to incorporate access. Their builders were also resurfacing the terrace, leading from the house. I needed to ensure a seamless link between their work and mine. I re used all of the concrete pavers to create a step across the width of the garden from the existing terrace and a path to a newly created small terrace for the eco studio. 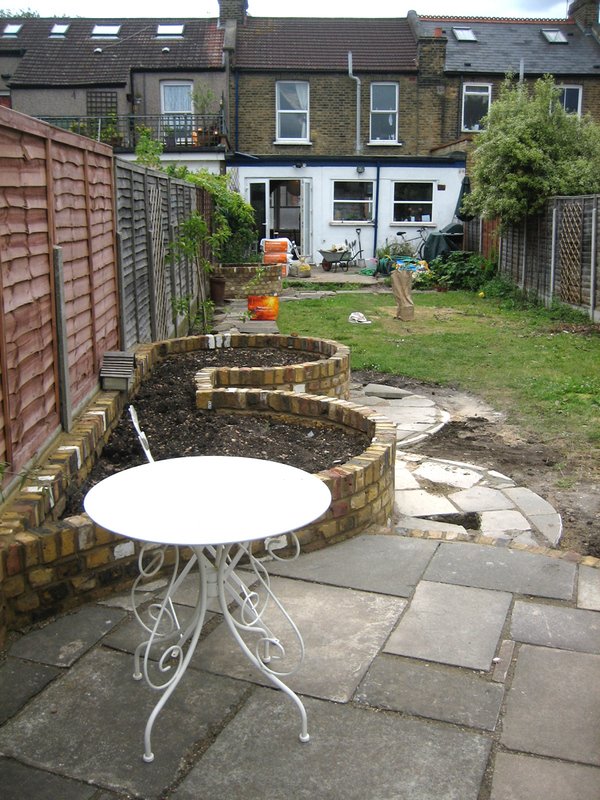 The new terrace was also built from the stock of paving in the garden and I have to confess at this point I was wondering if I was committing design suicide by creating what was essentially a huge area of crazy paving! I interrupted the sheer stretch of paving by planting prostrate Thyme in between the stones. 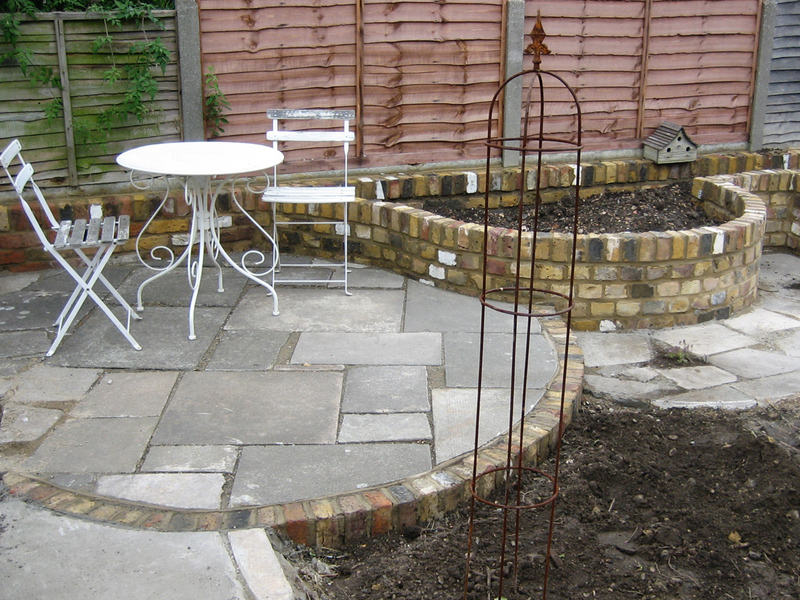 Raised beds were built along the sunny side of the garden using recycled yellow stock bricks to compliment the house. A large herb bed was also built. All were accessed via the crazy path. Climbers were planted along the fence panels using a system of vine eyes and wires for support. This was much more economical than buying in large trellis panels. Each climber was chosen for its favoured aspect and flowering time and included clematis, jasmine, trachelospermun and parthenosisus (Virginia creeper). A mini orchard of minarets fruit trees was planted to allow maximum crop production within minimum space. 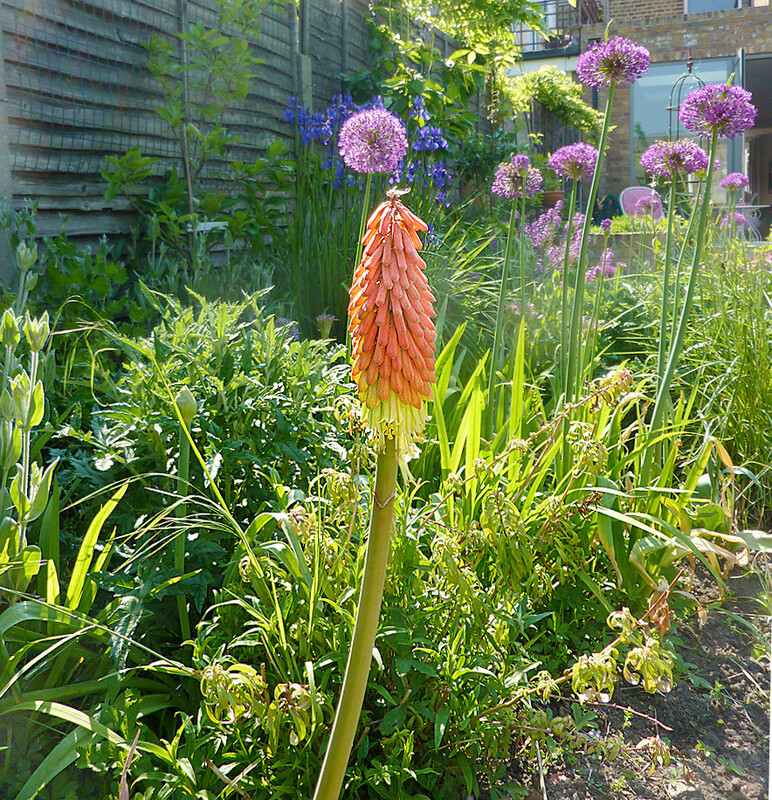 Two years after the design was built, the linear path down the side of the garden was lifted and re laid by the client and I. A random stepping stone pattern now allows more crops to be grown interspersed with ornamental companion plants for organic pest control. This was the client's idea and it works really well. The garden continues to be a work in progress.